Moving at the Speed of Creativity | iPads in Education: What important apps am I missing? iPads in Education: What important apps am I missing? This Thursday I’ll be sharing a full day workshop for faculty at Southeastern Oklahoma State University on “iPads in Education.” The following is a Google Doc I’ve created with links to about 30 different applications we’ll discuss and explore. If you’re viewing this page on an iOS device and cannot view the embedded version below, you can alternatively view this as a public Google Document. For some reason, my “fixed” placement of images looks fine on the embedded version of this document on my Google Site, but not on other pages. Bummer. There are obviously a LOT of content area specific applications for the iPad which we could also explore, but I’m wanting to primarily focus on applications which can be used for media consumption and media publishing. We certainly can “sprinkle in” other education applications, but I’d rather discuss fewer applications in greater depth than show 100+ apps but not give participants a chance to get “hands-on” use with very many. Given the enormous breadth of iOS applications now available with educational possibilities, putting together a workshop like this is a fun but formidable challenge. 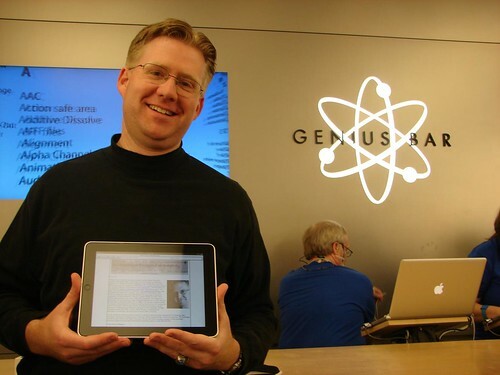 In the course of my web searches for sites about using the iPad in education, I found both the Teach with Your iPad wiki and the iPad Schools wiki. Both include lots of links to content specific apps. Do you know of other wiki sites specific to the iPad in Education which I should include on my list? One of my best finds in preparing for this workshop was the site linktoapp.com, referenced in this 2008 ARS Technica article. It provides a quick way to link directly to the iTunes page of different apps. Simply add the name of an application after the forward slash in the link “linktoapp.com/” and the site will forward you to the appropriate iTunes page for the application. If the app title includes more than one word, separate the words with the “+” symbol. This worked very simply for most of the applications on my list. I tried to create this entire workshop curriculum on my iPad, but could not figure out a way to add a hyperlink to a Google Document. 🙁 Office2 HD works well for basic editing of Google Docs on an iPad, but does not (at this point) support hyperlinks. If you have suggestions for additions to my iPad workshop resource list, I’d love to hear them. Feel free to use this list for your own iPad in education workshops too! 4 Responses to iPads in Education: What important apps am I missing? We hope to deploy soon. Great John, thanks so much for sharing this link! I added it to the iPads in Education workshop links I’m sharing with university faculty today here in Durant, Oklahoma. Great! We hope to get up and running soon. Once we do, the four teachers involved will be blogging their experiences. Thanks again! The iCelsius is an accessory that transforms your iPad into a digital thermometer. This can be used for teaching science.